Francesco Saverio Geminiani was highly cherished by his contemporaries because of his versatile musical gifts. He always worked at the highest levels, not only as a composer, but also as a violin virtuoso, teacher and theoretician. Presented here for the first time is a transcription of the “enchanted Forest” for organ, made by Laura Cerutti. Geminiani was commissioned by the architect and producer Giovanni Niccolò Servandoni to write the music to “The enchanted Forest”, a pantomime performed in Paris in 1754. The theme is taken from the 13th and 18th song in “Gerusalemme liberate” by Torquato Tasso. It tells of the attempts of Goffredo di Bugliones and Rinaldo to take up the siege of Jerusalem again, after the wizard Ismeno had bewitched the forest from which the soldiers wished to take their wood to build their machines of war. The simplicity of the plot offers Geminiani the opportunity to “describe” witchcraft, secretive places, spirits and battles. 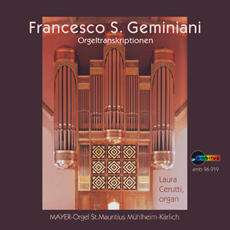 Edited by Laura Cerutti in a modern edition, these published concertos are transcriptions by Johann Baptist Cramer and bear the following inscription on the title page: Geminiani’s Celebrated six Concertos Op. 2 – Op. 3 As Perform’d by Mr. CRAMER bevor their Majesties at the ANTIENT CONCERT Tottenham Street and at the Hanover Square concerto Adapted for the HARPSICHORD, ORGAN or PIANOFORTE.